DomainKeys identified mail (DKIM) adds a secure signature to your domain to authenticate email sent from users in your company. DKIM is an industry best practice that increases the security of your email domains. For more information on prerequisite terminology, see Cloud Office support terminology. Create an SPF record policy. Create a DMARC record policy. For a video tutorial of the following steps, see Rackspace Email - DMARC / DKIM: What It Is & How to Setup. In the Domains section of the home page, click the Sender Authentication (DKIM) link. On the Sender Authentication (DKIM) page, click the domain for which you want to enable DKIM. Click the Enable DKIM for button. 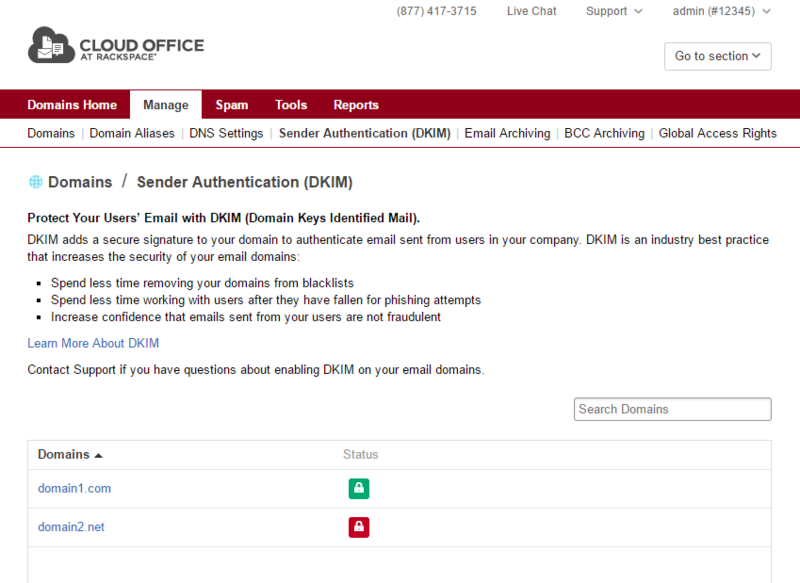 If your domain’s DNS is managed through your Cloud Office Control Panel, then DKIM enabling is automatic. If your domain’s DNS is managed through another service, then you are given the DNS key and value information to add a new TXT record. See the documentation of your DNS hosting provider for instructions on adding a new TXT record for your domain. If you do not know where your DNS is hosted, see Find your DNS host. After adding the DKIM TXT record, click the Verify TXT Record button to ensure that the new DKIM record is publicly available in DNS and is correct. If validation fails, then an appropriate error message is displayed to help you correct the problem. After DKIM is enabled, all new outgoing email messages are signed using your new DKIM key. You can repeat the DKIM enabling process on other supported domains.